Haynes Family: Families are Great! We were able to spend a weekend in San Antonio with Dan's whole family recently. It was so nice to be together with all the sisters and their families. Even K.C. was able to come down from military training to be with us. 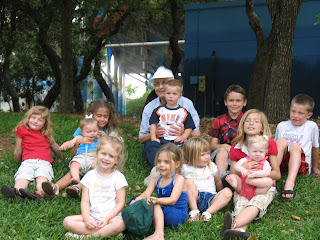 We all went to Sea World and had a blast despite the heat and the record number of people in attendence at the park! We also celebrated Grandma Jackie's 80th birthday.